In 1874, the islands were bought by the powerful Florio family whose business interests included sulphur mining, tuna fisheries and of course Marsala wine. Still today the Egadis are home to the largest tuna fishery in Sicily and thousands throng here every year to watch the traditional tuna cull, La Mattanza. Favignana, or La Farfalla as it is often referred to thanks to its butterfly shape, is the largest and most important of the islands. It lies some 10 miles of the Trapani coast and is a popular holiday destination in the summer months largely thanks to its crystalline azure waters in bays such as Cala Rossa. The main town, also known as Favignana, has a small port and is dominated by the Fort of Santa Caterina, originally built by the Arabs as a watchtower, enlarged by the Normans and then used as a prison by the Bourbon Kings. With its two main piazzas and its low Mediterranean houses, the town is quite pretty. It is also home to two buildings testifying to the influence of the Florio family: Palazzo Florio, built in 1876 near the harbour, and the large, abandoned skeleton of the Florio tuna fishery. But what most people come here for are the crystalline waters offering excellent swimming and good scuba-diving possibilities, especially in the sea caves such as Grotta Azzurra, Grotta dei Sospiri (sospiri means “sighs” – it is said that the cave moans during the winter), and Grotta degli Innamorati (the Lovers’ Grotto). 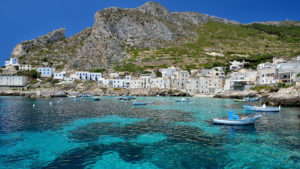 Marettimo is the most isolated of the Egadi Islands, lying a full 15 miles off the coast of Trapani. As such it is wonderfully unspoilt both in terms of its marine life and its rugged mountainous hinterland. Dramatic limestone cliffs plummet towards the cobalt-blue sea, endless panoramas abound, and mountain paths offer wonderful walking. The small village of Marettimo houses a couple of restaurants serving sublimely fresh fish though little else. Some of the local fishermen will be happy to accompany you on a boat trip around the island to see the numerous caves one of which, the Grotta del Cammello, hosts a pebbly beach and the remains of a Roman settlement. Getting to the Egadi Islands is very easy. Just hop on one of the frequent hydrofoils from Trapani or Marsala and in a few minutes you’ll be there!